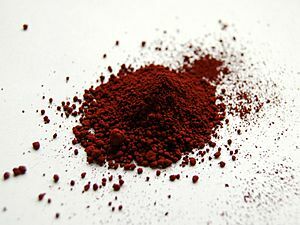 Iron(III) oxide, also known as rust, is a reddish substance. It has a chemical formula of Fe2O3. It is made by the reaction of iron with oxygen. It is found naturally in the ground. It is a major ore of iron (iron comes from this mineral) as haematite. It dissolves in acids. The iron is in the +3 oxidation state, which is what the III means. If the iron was in the +2 oxidation state, it would be iron(II) oxide. Iron(III) oxide Facts for Kids. Kiddle Encyclopedia.